We don't typically crib fashion ideas from the corporate world, but we have to admit the classic striped shirt has its merits. Of course, like any piece, it's really all about how you style it. The striped-shirt outfits we're talking about bear little resemblance to your dad's business suits (although his too-big blazer might actually be on trend at the moment). 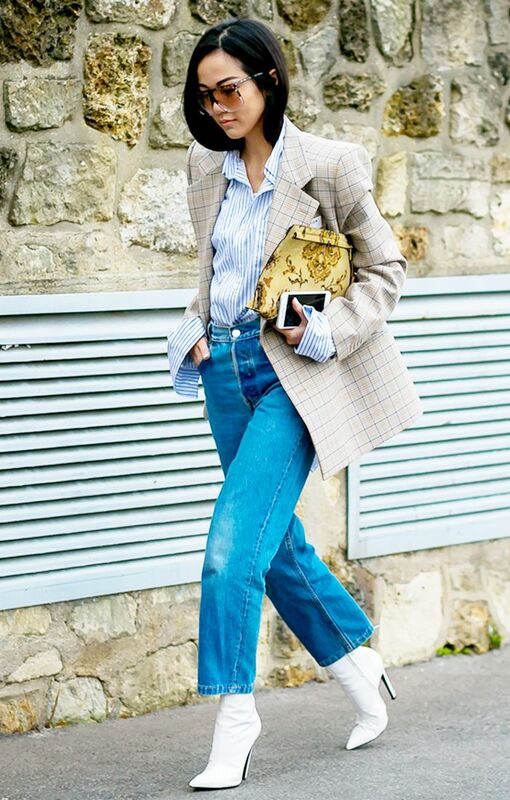 Instead, fashion types are wearing their button-downs with everything from slip dresses to track pants and accessorizing with fluffy sandals, cool sneakers, and brightly colored bags. In short, they're putting a new spin on a piece you probably already have sitting in your closet—and offering plenty of inspiration to carry you through the season. Below, see 23 ways to pull off a striped shirt, and then shop styles for every taste and budget. Stripes and plaid are a perfect pair. Play with proportions when layering stripes on stripes. Toughen up a businesslike button-down with plenty of black leather. The conventional wisdom is to pair an oversize garment with something more streamlined, but here's proof that doubling up on extra-large pieces can work just as well. A denim corset? Sure, why not? Sometimes one sleeve is better than two. Keep a turtleneck on hand for cold-weather layering. Try an unexpected take on the skirt suit. Slip dress + button-down = ideal match. An easy outfit for weekend wandering. Who says navy and black shouldn't be worn together? Add a pop of yellow to brighten up your blue and white. Primary colors and cascading ruffles make this a winning look. Here's one way to make a glossy patent mini work for daytime. The half-tuck is an easy styling move that makes a big impact. Swap out trousers for track pants, and you'll score far more fashion points. Style a ruffled top with low-slung wide-leg pants. The midi skirt and mules are perfectly polished. This look takes "sweater dressing" to the next level. Rounded sleeves create an eye-catching silhouette. When in doubt, add more stripes. With a shirt this big, who needs pants? This post was originally published at an earlier date and has since been updated. Up next, learn about the new way to wear double denim this season.